Ali Smith and Shaun Barnett both netted twice and joined on the scoresheet by goals from Andrew Latimer, Rob Heaney and Robbie Alder. Just goal difference behind them are Wilstead and Flitwick Town, the boys from Jubilee Playing Fields holding down second spot by virtue of having scored one more goal than the Town after they notched up their third consecutive away win. 4-3 at Cranfield United. Lewis Duffield, Alex Russell, Colin Marshall and Aldo Simms scored the vital goals against United replies via Josh Burnapp with a brace and David Adderson. Whilst the Town made it three wins on the bounce by running out 4-1 winners at Sharnbrook, Phil Matthews netting twice alongside single strikes from Dan Stafford and Josh Reynolds against a lone home reply via Jacob Hukin. Now up into fourth are Shefford Town & Campton who likewise took their winning ways up to three games with a 4-0 home win over bottom of the table Sandy. Ryan Lewis netted twice alongside single strikes from Andrew Hayday and Louis Taylor. Enjoying life on the road to move up into the top six were Ickwell & Old Warden who maintained their 100% away record with a 5-0 victory at Ampthill Town Reserves. Lee Threadgold with a brace was joined on the scoresheet by Ashley Boness and Dean Hamilton to bring up the nap hand. Also winning on the road and now in seventh were Stevington, the 3-0 winners at Wootton Blue Cross. Kieran Souter, Ben Walsh and James Bourke all found the back of the net. Renhold United could only share the spoils with Caldecote in a 1-1 draw, Ollie Housden the United marksman and the Caldecote reply an own goal. The stand out result of the afternoon belonged to AFC Kempston Town & Bedford College Reserves who emerged 5-4 winners at last season’s beaten finalists Crawley Green Reserves. Scott Dummett with a brace was joined on the scoresheet by Jesse Sidhu, Colby Smith and Kurtis Alleyne to bring up the nap hand against home replies via Jack Randall twice plus Ed Skinner and Adam Marsh. However going one goal better were Queens Park Crescents the 6-3 winners at Henlow. Ayaz Hussain leading the way with a hat-trick and joined on the scoresheet by Shadaz Sattar, Hassan Yousaf and Anish Khinda against home replies via Charlie Watson, Paul Wright and Russell Bull. otternhoe Reserves were 4-0 winners at Luton Leagrave AFC, Michael Sinclair with a brace plus an own goal and a strike from Charlie Beary marking their scoresheet. Joining them in the hat for the round two draw will be both The 61FC Luton Reserves and Westoning. The 61FC were 3-2 home winners over Biggleswade United Under 23s thanks to a penalty from Pavel Pyziak plus strikes from Lee Garner and Abdullah Ahmed. Westoning, after being held 2-2 at 90 minutes by Meltis Albion ,won the penalty shoot-out 3-1. Nick Shirley and Sam Taylor scored in normal time against a brace in reply from Carl Townsend. Alas for three other clubs it was the end of the road. Elstow Abbey lost 6-3 at Houghton Rangers despite a brace of goals from Dom Parrella and a strike from Lucas Banton. Ickleford, with goals from Gareth Head and Guiseppe D’Angleo, were beaten 3-2 at St Joseph (Saturday). The third club, M&DH Clapham Sports, went out 6-5 in a penalty shoot-out after 90 minutes play had seen them drawing 3-3 at North Sundon Wanderers. Sam Maddix scored twice and Grant Williams once. Wixams are five points clear at the head of Division Two following their 5-1 home win over Potton Town. Gaz White led the way with a hat-trick, joined on the scoresheet by Iain Hall and Charlie Battams to bring up the nap hand against a lone reply from Chris Cooper. Now up into second are Lea Sports PSG who ran out 3-1 winners at Riseley Sports. Joe Hennem with a brace plus a strike from Dylan Cadger did the damage against a lone home reply via Mitchell Crook. There was a first win of the season for Caldecote Reserves who emerged 3-2 home winners over Sundon Park Rovers. Neil Giles, Scott Foxwell plus an own goal outweighed Rovers replies from Shane Roberts and Ethan Tenn. Leading the way at the head of Division Three are Kempston Athletic following their 4-3 home win over Renhold United Reserves. Josh St Clair Pierre with a hat-trick was joined on the scoresheet by Gary Whitbread against United replies via Justin Ludman, Thomas O’Neill and JP Stribling. Just a point adrift in second are Marston Shelton Rovers Reserves, 7-5 home winners over Caldecote A. Ross Milton and Dale Maiciw both netted twice alongside single goals from Tim Brown, George Roberts and Jamie Watson. Gary Allum and Jamie Richardson with braces plus Carl Heath brought up the visitors’ nap hand in reply. In third spot are Wilstead Reserves who emerged 4-0 home winners over AFC Dunton thanks to goals from Luke Pursey, Luke Prietzel, Hanni Thiarra and Liam Philip. In fourth spot are Sandy Albion the 1-0 away winners at White Eagles thanks to a strike from Luke Rudd. CS Rovers are now back onto the top of the Division Four league table after winning 3-0 at Flitwick Town A. Ultan Coonan, Connor Darocha and Connor Hasson grabbed the vital goals. Henlow Reserves moved up into fourth following their 3-1 victory at Lidlington United Sports. Sam Crow, James Davis and Oliver Cattley saw their goals replied to by United’s Paul Nuthall. 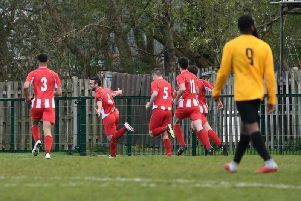 Kempston Hammers Sports began their defence of the Beds FA Junior Cup with a narrow 2-1 victory at Sandy Reserves thanks to a brace of goals from Chris Greene against a lone home reply from Liam Brophy. But perhaps the result of the day belonged to Wootton Village who emerged 5-4 penalty shoot-out winners at Atletico Europa after 90 minutes play had seen the sides deadlocked at 1-1. Kane Alexander wason the home scoresheet and Adam Flynn netting for the Village. The highest scorers of the day were Harlington who won 5-3 at Houghton Hatters. Farrell Whitman, Luke Pawaar, Lesile Medford, Redge Miongold plus an own goal brought up the nap hand. Whilst also enjoying life on the road were Cranfield United Reserves, 2-1 winners at Dinamo Flitwick. Ryan Collis and Adam Kerr marked the United scoresheet against a lone home reply from Dale Goldie. Elsewhere there were home wins for three other sides. The best of which belonged to Bedford Albion with a 3-0 win over AFC Oakley M&DH Reserves. Shaun Challi, Shane Canzano and Adam Lewis were the scorers. Stevington Reserves were 2-0 winners over Clifton thanks to strikes from Cameron Cain and Nathan Bavister. However Flitwick Town Reserves required a 4-2 penalty shoot-out win to see off AFC Kempston Town & Bedford College A after the sides were deadlocked at 1-1 come the 90 minute whistle. Peter Kouwenberg the Flitwick marksman and Gavin Cheema netting for the visitors. Alas it was the end of the road for Shefford Town & Campton A beaten 3-2 at home by FC Spandits despite a brace of goals from Scott Frusciante.